Air traffic control authorities in North and South Korea have issued warnings to aircraft associated with North Korea’s planned rocket launch in April. The warnings follow a message issued last week by authorities in The Philippines concerning restrictions on airspace during the April 12th to 16th launch window. The South Korean warning prohibits aircraft from flying within the first-stage drop zone, which was earlier identified by North Korean authorities (see embedded map, below). Both warnings are valid from April 12th to 16th. The South Korean warning runs from 7am local time to noon local time, which matches the launch window earlier announced by the Pyongyang government. North Korea’s aviation warning runs an extra hour each day, until 1pm local time. It’s unclear if this one hour extension is a mistake or intentional. The warnings, officially called “Notice to Airmen”) are intended to keep aircraft away from the area through which the rocket is expected to travel during launch and the areas through which the first and second stages are expected to fall back to earth. Those latter areas include a rectangular zone off the western coast of South Korea and one in the Pacific to the northeast of Manila. Such warnings are regularly issued by air traffic control authorities worldwide for instances such as rocket launches, military exercises, special events and for security reasons. 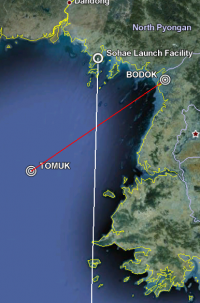 E) ATS RTE SEGMENTS CLSD: B332 BODOK-TOMUK ATS RTE YOMJU-POINT 2 DUE TO LAUNCH OF AN EARTH OBSERVATION SATELLITE. E) TEMPO PROHIBITED AREA ACT DUE TO ROCKET LAUNCHING BY DPRK : AREA BOUNDED BY 351225N1245223E-355510N1245025E-355520N1243210E- 351213N1243034E TO THE BEGINNING. -RMK : ROCKET DEBRIS WILL FALL IN THIS AREA. And here’s the embedded map. Click on the map controls to zoom in and move the map around. Where is North Korea’s satellite heading?